Although I was cognizant of a multitude of possible symbols in the poem during my initial examination of Samuel Taylor Coleridge’s poem, “The Rime of the Ancient Mariner,” I avoided judging the poem’s meaning while reading the poem because I was more focused upon the other moving aspects of the work. I thought this poem was extraordinarily imaginative when I first read the poem because of Coleridge’s ingenious descriptions of the mariner’s terrifying experiences and because of the well-crafted and nuanced choices of words he utilizes in the poem. However, I also was very aware of the dark themes of the poem that I assumed had some kind of deeper spiritual meaning as well. Overall, this poem reminded me of a nightmare—but mostly because of Coleridge’s unparalleled sense of imagery that he exhibits in the poem that enlivens the characters and beings in his chilling poem as if they were from a nightmare that Coleridge may have dreamed. Nonetheless, the story of the mariner is also full of horrendous plights and twists of fate that also definitely seem akin to the ongoing crises that accompany the mood and tone of nightmares. Despite the intensity of the poem, I really enjoyed reading it because Coleridge created fantastic and fascinating images throughout the poem that stem from his ingenious writing style that bring to life his visions that he hoped to instill in his audience through his brilliant writing. In particular, I admired his depiction of the water snakes that appear during the Mariner’s journey: “They moved in tracks of shining white. . . . Blue, glossy green, and velvet black, / They coiled and swam, and every track / Was a flash of golden fire” (Coleridge 279-282). So, my initial impression of Samuel Coleridge’s poem, “The Rime of the Ancient Mariner,” mostly made me aware of the depths of Coleridge’s imagination and his gifts as a storyteller who clearly can manifest his detailed ideas and fantasies into harmonious poetic language. Depending on the interpreter, it expresses Coleridge’s personal life or psychoanalytic case, his poetic theories, religious beliefs, pantheist metaphysics, biblical hermeneutics, belatedness in literary history, or feelings about Western maritime expansion, about slavery, or about politics generally. The albatross is nature, Coleridge himself, Sarah Coleridge, a human being, Christ, the Divine immanent in nature, or fresh meat as an antiscorbutic. The world of the poem is providential, existential, morally incoherent, or dreamily irrelevant” (Perkins 425). Therefore, there is no conclusive way to decipher the poem’s symbolic and spiritual meanings. However, I did enjoy studying the scholarly research that brings to light the potential underlying inspirations for the poem’s plot structure and possible symbolisms. The desiccated boards portray the mariner devitalizing. The seaman withers away physically and psychologically in the same manner that the wooden planks shrink because of a lack of water. . . . After the mariner suffers from dehydration and realizes he is not a superior being, he appreciates all animals. . . . The mariner’s experience parallels the visualization of parching planks and illuminates the message that all creatures deserve veneration. The ocean steals water from the ship and the mariner, hoping to initiate equality among all creatures” (Zins 195). So, elements of the setting itself and the relationship between components of the setting and the mariner have been interpreted in numerous ways. Although when I initially read the poem I was aware of the possibility that aspects of the setting may be thematically significant, I did not assume that the theme meant anything particularly—and given the lack of agreement among scholars regarding the definite, underlying meaning of the setting’s symbolic pertinence, it seems my initial decision to avoid judging the poem’s setting symbolically was intuitively sound. In summary, after reading through the scholarly criticism of the poem, I still believe that the potential symbolic meanings of the setting are too complex and complicated to be judged accurately by anyone but Samuel Taylor Coleridge. There are also other theories that focus on elements of the poem that relate more to its overall composition and structure. For example, Daniel Watkins believes that historical events motivated Coleridge’s shaping of the poem and refutes that Christianity or even Coleridge’s psychological state drove Coleridge to write his poem (Watkins 23). Moreover, other scholars like Michael Murphy believe that the distressing life of John Thelwall, a man who was blamed continuously by the British government and society for crimes he never committed, inspired Coleridge to construct his poem to capture the nightmarish existence of a chronically condemned man (Murphy 63). Nonetheless, other scholars including Alice Chandler propose that the events of the poem are driven by an underlying force that could be God but is definitely “modulating” the events of the story so that every symbol and event has an inverse “modulation” (Chandler 402). Alternatively, literary critics like Tristam Coffin insist that the plot of the story is impossible to fit into any psychological, theological, or intellectual framework and only the “ballad meter” of the poem “makes the weird story possible to believe” (Coffin 437). After reading through the criticism of the poem’s structure and format, I still remained fairly open to entertaining most of the scholarly ideas regarding the Coleridge’s motivations that led him to create the narrative story line and poetic language of his poem, and I studied too many differing scholarly texts to be able claim that I could choose one opinion that I believe may be accurate among the collection of assessments. The perception of Samuel Taylor Coleridge’s poem, “The Rime of the Ancient Mariner,” has been overwhelming salutatory given Coleridge’s undeniable display throughout his poem of both his exceptionally rich inner imagination and adept ability to craft melodious poetry. Despite the amazing qualities of Coleridge’s poem that have garnered Samuel Taylor Coleridge considerable attention for his literary achievement, the meaning of the poem’s potential symbols have never quite been resolved and many aspects of the poem remain enigmatic. Nonetheless, the mysterious forces and haunting harmonies that exist throughout the poem perhaps were meant to remain as uncertain as they seem, and the poem’s main message may just be that men are forsaken to be humble dependents of the fortunes of fate and higher powers that they may never understand but must heed. Al-Joulan, Nayef Ali and Amer Hasan Al-Rashid. “Dis/Continuities: Natural and Artistic Landscape/Seascape in T.S. Eliot’s ‘The Waste Land’ and S.T. Coleridge’s ‘The Rime of the Ancient Mariner.’” Cross-Cultural Communication. 7. 2. EBSCO HOST. 2011. Pgs. 265-271. Web. 16 Mar 2013. <http://0-search.ebscohost.com.sophia.agnesscott.edu/login.asp x?direct= true&db=a9h&AN=69 540417&site=ehost-live>. Chandler, Alice. “Structure and Symbol in ‘The Rime of the Ancient Mariner.’” Modern Language Quarterly. 26. 3. EBSCO HOST. September 1965. Pgs. 401-414. Web. 16 Mar 2013.< http://0-search.ebscohost.com.sophia.agnesscott.edu/login.aspx?direct=true&db=a9h&AN =10073503&site=ehost-live >. Coleridge, Samuel Taylor. 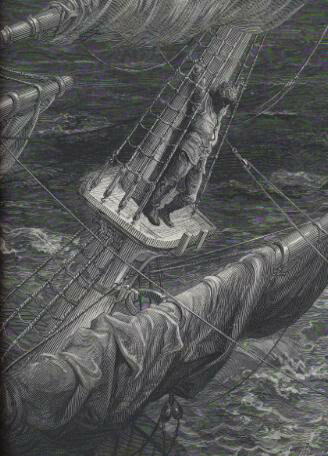 “The Rime of the Ancient Mariner.” Romanticism: An Anthology Third Edition. Pgs. 694-711. Ed. Duncan Wu. Malden: Blackwell, 2006. Coffin, Tristam. “Coleridge’s Use of the Ballad Stanza in ‘The Rime of the Ancient Mariner.’” Modern Language Quarterly. 12. 4. EBSCO HOST. December 1951. Pgs. 437-445. Web. 16 Mar 2013. <http://0-search.ebscohost.com.sophia.agnesscott.edu/login.aspx?direct=true&db=a9h&AN=10035702&site=ehost-live&gt;. Dilworth, Thomas. “Parallel Light Shows in Coleridge’s ‘The Rime of the Ancient Mariner.’” Explicator. 65. 4. EBSCO HOST. Summer 2007. Pgs. 212-215. Web. 16 Mar 2013.< http://0-search.ebscohost.com.sophia.agnesscott.edu/login.aspx?direct=true&db=a9h&AN =26288491&site=ehost-live >. Murphy, Michael. “John Thelwall, Coleridge, and The Ancient Mariner.” Romanticism. 8. 1. EBSCO HOST. 2002. Pgs. 62-75. Web. 16 Mar 2013. < http://0-search.ebscohost.com.sophia .agnesscott.edu/login.aspx?direct=true&db=a9h&AN=8794176&site=ehost-live>. Perkins, David. “The ‘Ancient Mariner’ and its interpreters: Some versions of Coleridge.” Modern Language Quarterly. 57. 3. EBSCO HOST. September 1996. Pgs. 425-449. Web. 16 Mar 2013. <http://0search.ebscohost.com.sophia.agnesscott.edu/login.aspx?direct=true&db=a9h &AN=9610232998&site=ehost-live>. Watkins, Daniel. “History as Demon in Coleridge’s ‘The Rime of the Ancient Mariner.’” Papers on Language & Literature. 24. 1. EBSCO HOST. Winter 1988. Pgs. 23-34. Web. 16 Mar 2013. <http://0-search.ebscohost.com.sophia.agnesscott.edu/login.aspx?direct=true&db=a9h&AN= 7728481&site=ehost-live>. Zins, Kimberly. “Equilibrium in Coleridge’s ‘The Rime of the Ancient Marine [sic].’” Explicator. 66. 4. EBSCO HOST. Summer 2008. Pgs. 194-196. Web. 16 Mar 2013. < http://0search.ebsc search.ebscohost .com.sophia.agnesscott.edu/login.aspx?direct=true&db=a9h&AN=34871 147&site=ehostlive>.